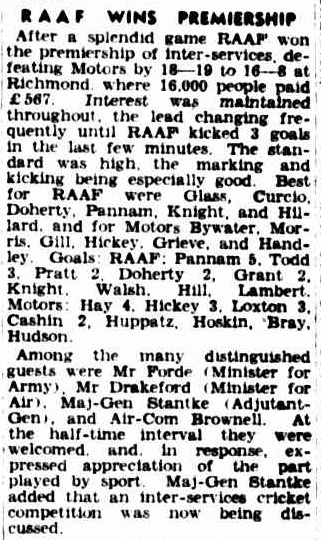 The 1942 Inter-services competition featured some of the biggest names of the day such as Alan La Fontaine, Laurie Nash, Alby Pannam, Phonse Kyne, Bob Pratt and Frank Curcio . Players from the VFL, VFA, country Football teams and from Interstate participated, making it both of high grade and of interest to a wide range of football followers. 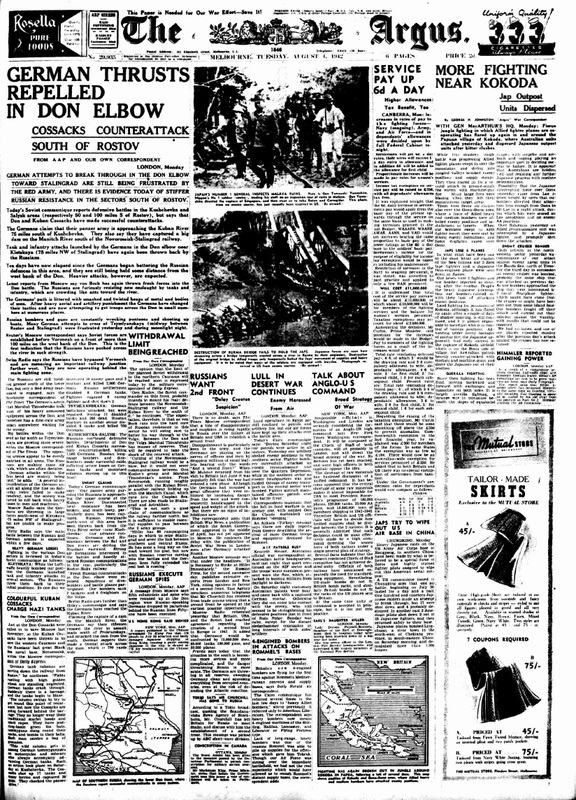 By May 1942 the Second World War was at a climactic point. Japan bombed Pearl Harbour in December 1941, followed by six months of success. Singapore had surrendered in February 1942 sending many Australians into POW camps. In February, U.S. General MacArthur had left the Philippines. The ugly island fighting in the Pacific had started, and fighting started on the Kokoda track in July, right on Australia’s doorstep. The great carrier battle at Midway in June 1942 turned the Pacific war but at the time this was not clear. In Europe, Nazi Germany was fighting hard against Russia, following on their successes in 1941. Focus on oil fields in Russia’s south though June and July 1942 brought the German army to the city of Stalingrad where a climactic battle would be fought at the end of the year. Melbourne was a centre of military activity. The US-Australian Headquarters were established on St Kilda Road and General McArthur arrived in March. 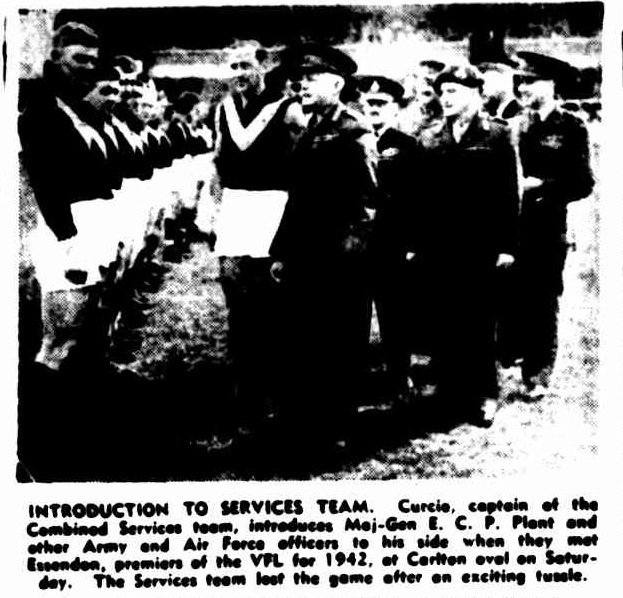 US Soldiers rested in Melbourne and the Argus increased its coverage of U.S. baseball. 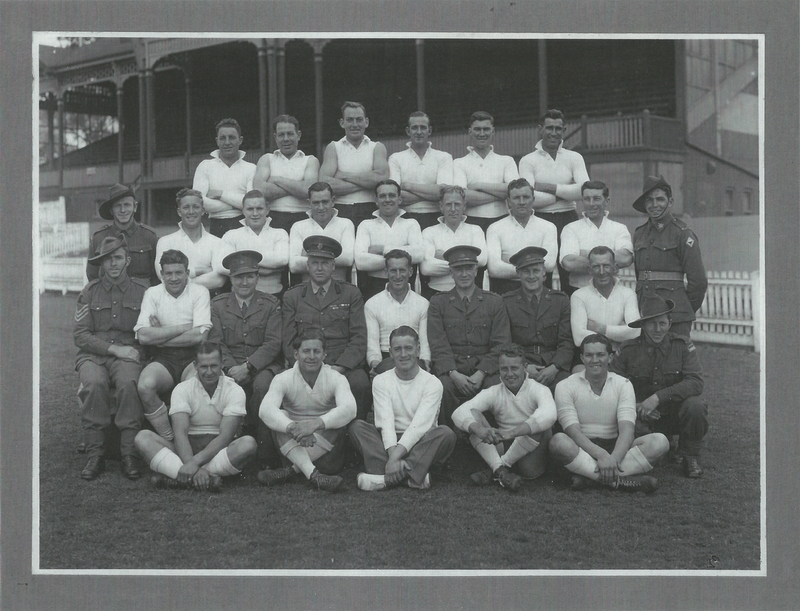 Australian Army, Navy and Air Forces were being trained in various camps in and around the city and a number of football grounds were used for various military purposes. Rationing was in place for petrol, paper and food. Newspapers became thinner and transport became difficult to find. 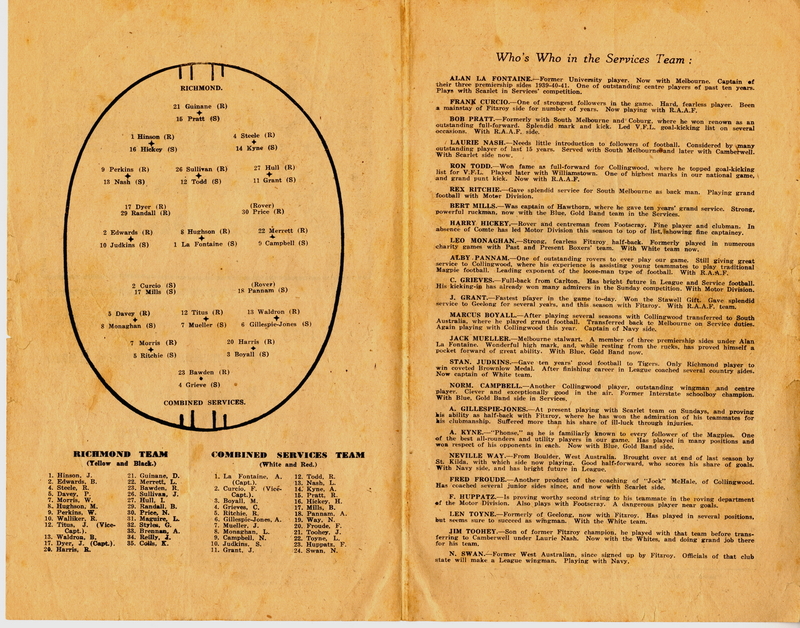 Geelong opted out of the VFL in 1942, with a major factor being transport difficulties. 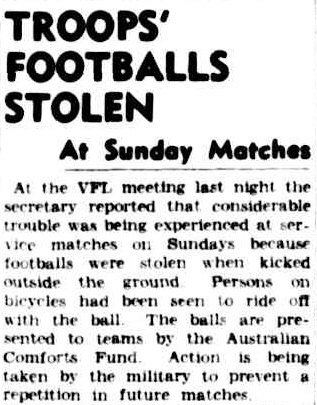 The VFA (and many other leagues) closed down completely due to a combination of problems such as access to grounds, availability of players and some had ethical questions over continuing organised sport while the war was on. The VFL chose to continue playing football through the war. 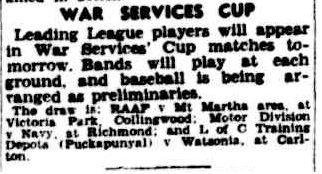 Though many players were unavailable due to war service, VFA, country and interstate players swelled the ranks. 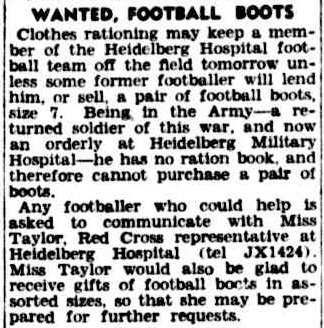 The VFL raised money for the war effort through the ‘comforts fund’. The fund provided money for sporting equipment and entertainment for services personnel. 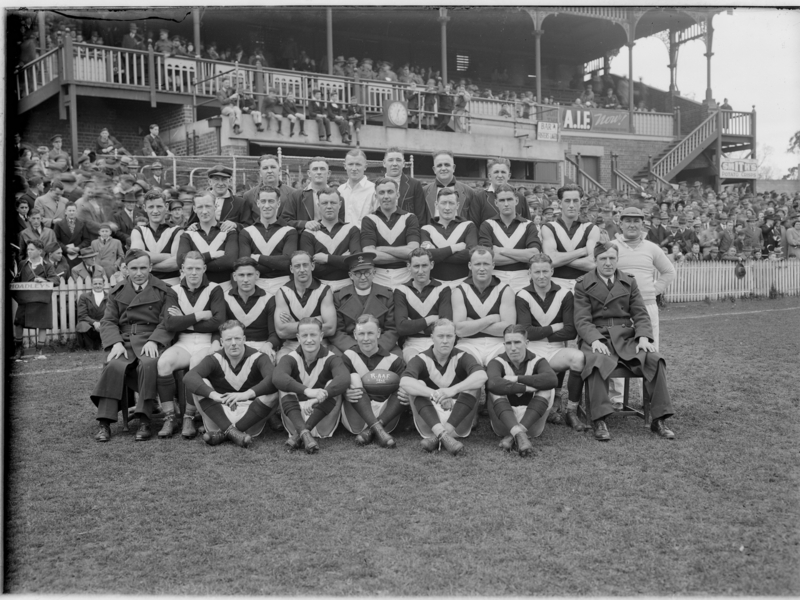 With so many men undertaking training in Melbourne, it is no surprise that a wide range of sports were played including athletics, baseball, football and cricket. 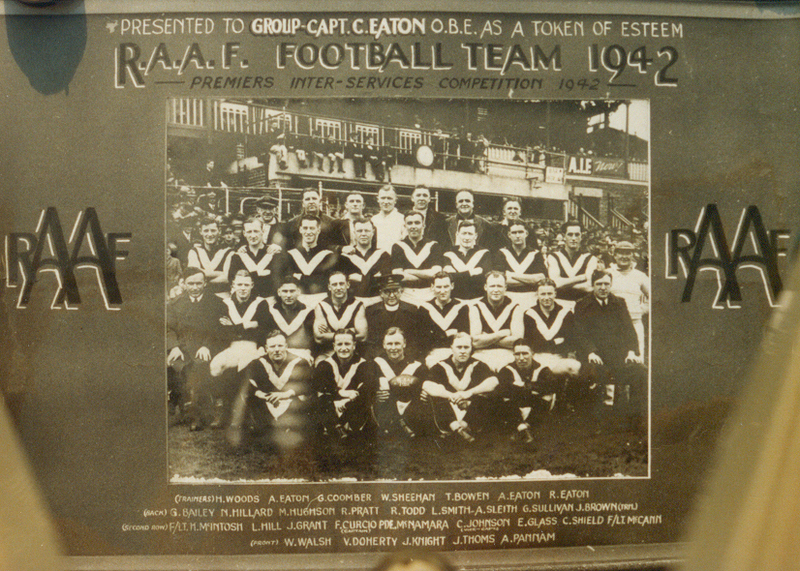 Both the Army and RAAF ran internal football competitions and football. 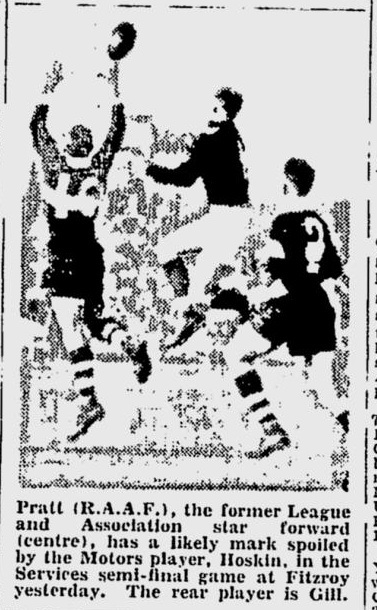 The Argus reported that Major-General Stanke Adjunct General requested that there be a competition (Argus 6-May-1942 p8) and the VFL was approached to provide grounds. Further League support via provision of umpires, ground attendants, trainers as well as footballs was also provided. It was decided to have no entry fee but to ask each spectator to donate to a patriotic fund. 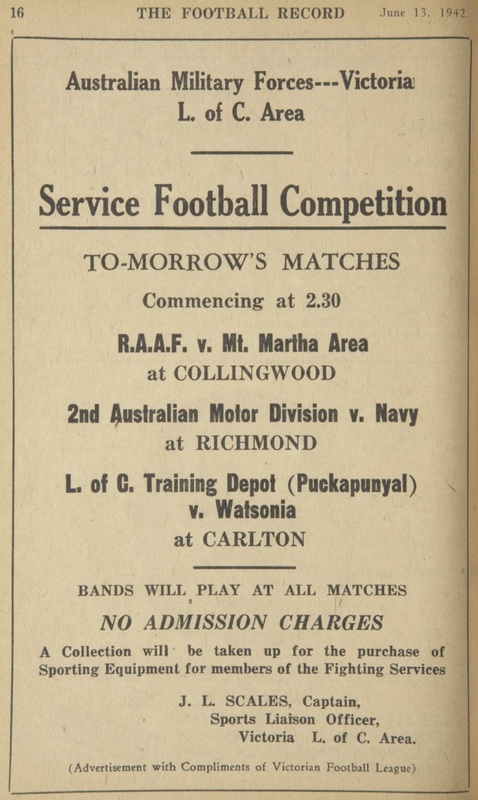 With internal competitions already in place, the inter-services competition created an inter-service rivalry. 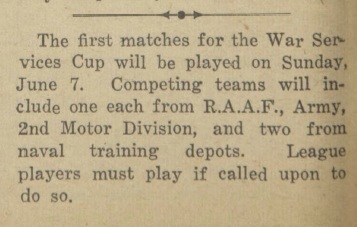 The army agreed to field three teams, “each of which will be up to League Standard”. With so many big name players having joined the Service, it can easily be imagined how excited the organisers must have been setting up their teams. 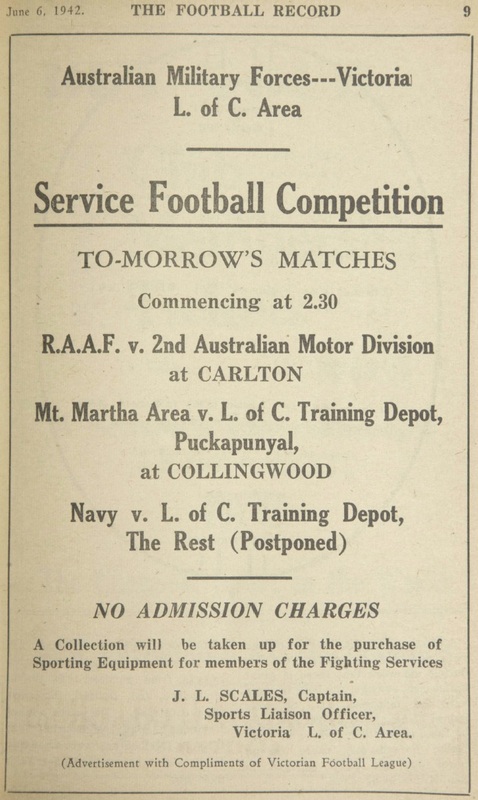 The competition eventually settled on eight teams, RAAF, Navy, and Army Teams representing various bases and units. Bands and baseball games were used to lure in the public. 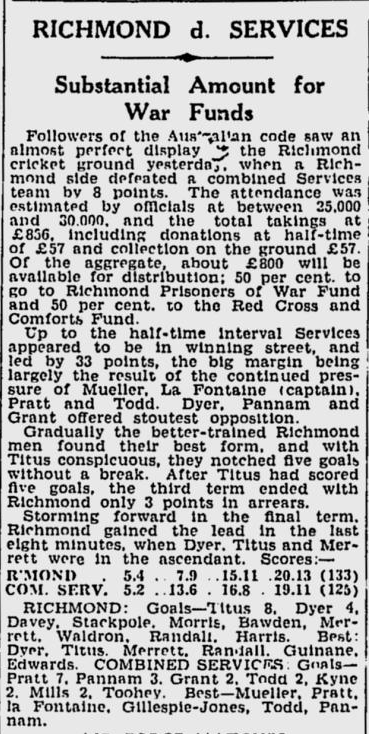 Crowds at the first game were 2,000-3,000 but rapidly grew to 30,00 per game. The VFL support for the competition varied throughout the competition and at least one pundit suggested that the now popular Services competition be moved to Saturdays in competition with the VFL and because many stars were in the Services, the VFL would be reduced to second tier status. 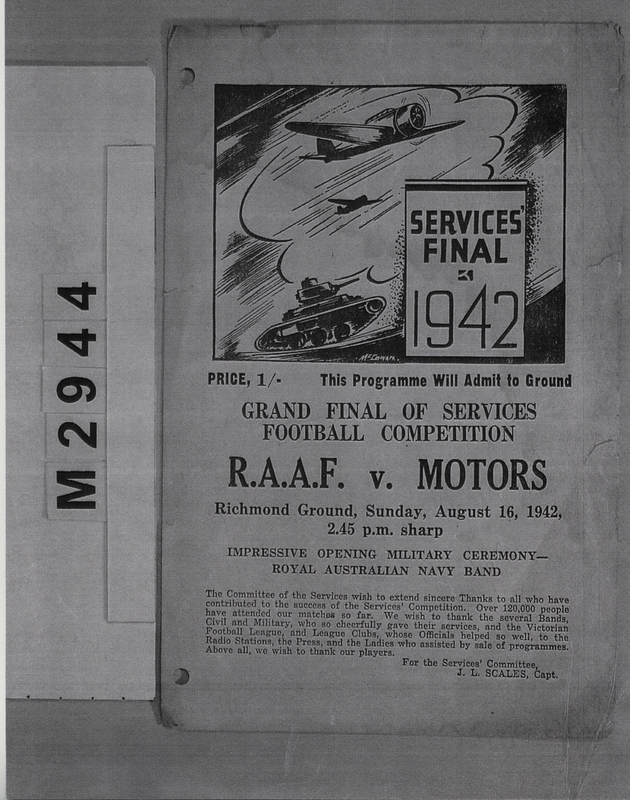 The fact that the VFL continued through the war while other competitons shut down was still a contentious issue to some. Team names fluctuated throughout the competition due to issues with censorship. 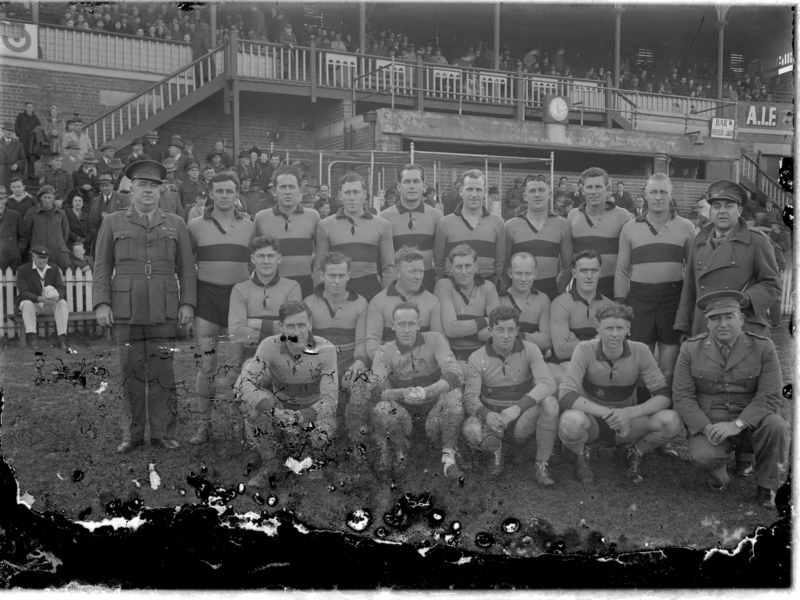 Watsonia forfited their place in the finals, probably due to troops moving north to Queensland and New Guinea. 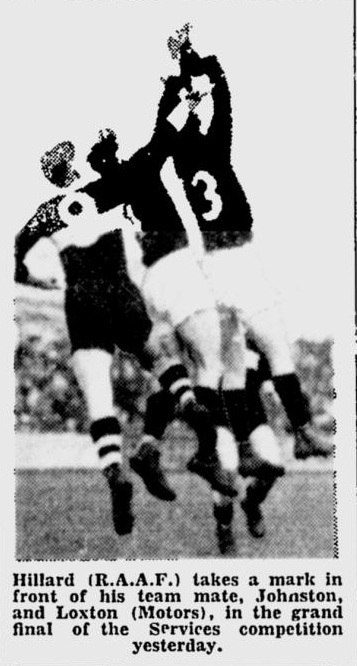 For the final game before the finals, the Argus (Argus 17-Jul-1942 p6) reported that the Navey had 8 league players in their team and the opposing Watsonia whites had 9 VFL players. 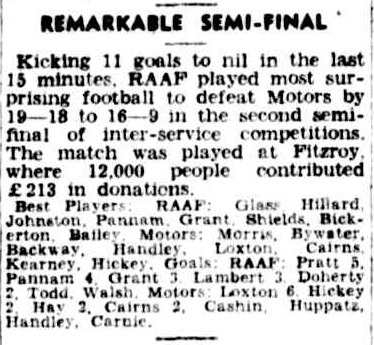 For the semi final game the Argus (Argus 1-Aug-1942 p10) reported that with an exception of one, the Motors team were all League players. 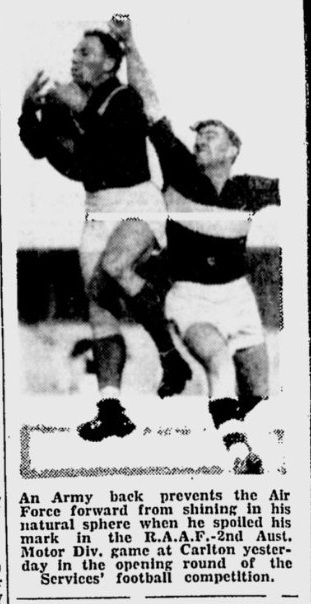 Kew Ming (Echuca, North Melbourne), Long distance Kick record Holder from 1929. 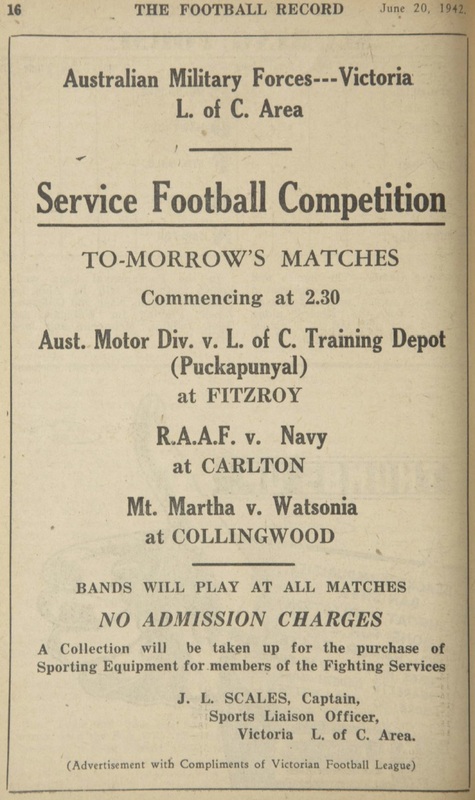 Combined Services Teams played twice during 1942. 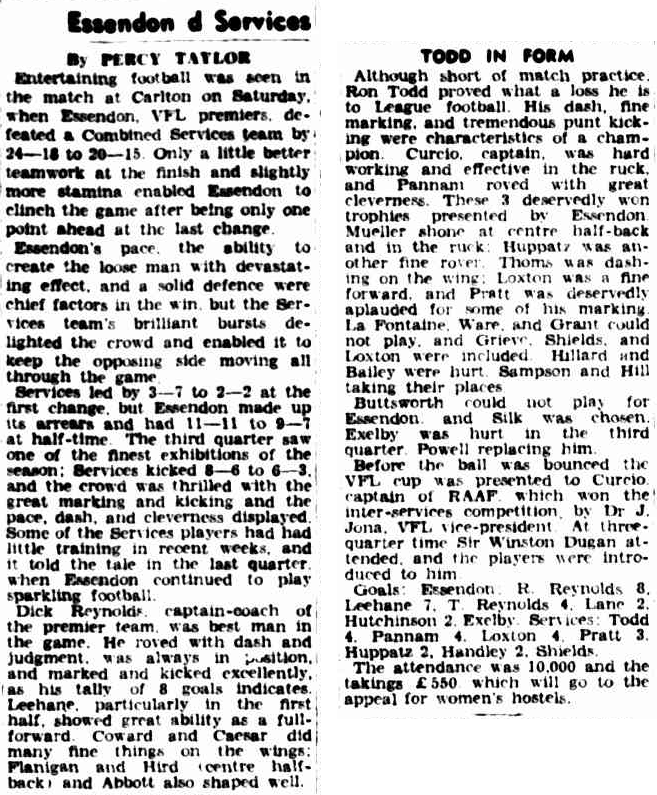 The first game was against Richmond (plus a couple of Fitzroy ring ins named Mick Hughson and Noel Price) and then the second match against the VFL premiers Essendon. The VFL teams won both matches in close contests.